Andawthein pagoda stands 100 feet away from the northern part of Chitthaung pagoda. The pagoda and the prayer hall are fenced with the wall which is made of brick. 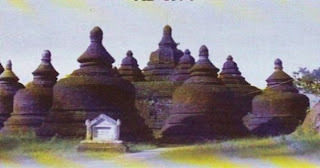 The hillock on which the pagoda stands, is the spur of Phoekhaung mountain and it is eight feet high. Before Andawthein was built, king Min Hla Ra Zar Saw Mon, the twelfth king of Mraukoo dynasty, built the prayer hall and Buddha image at the present place of Andawthein in AD 1521. By the time king Min Bar was the governor of Thandwe, the monks from Rakhine had to go to Srilanka for the missionary work because Theravada Buddhism was on decline in Srilanka. The mission of Samgha was led by Ashin Tay Zar Ra Tha from Thandwe and Ashin Dha Ma Vi La Tha from Mraukoo. When they got back from Srilanka. Ashin Tay Zar Ra Tha gave the molar relic of Buddha to Ba Saw Yee, the governor of Thandwe. The crown prince Ba Saw Yee built a pagoda enshrining the molar relic of Buddha in it on Warthura mountain of Thandwe near the present Andaw pagoda. When Ba Saw Yee became a king with the name of Min Bar, he brought back the molar relic from Andawthein pagoda of Thandwe, but he put the replica molar relic in the place of it. He worshipped the molar relic he took from Thandwe by putting in the golden salver at the funeral chamber in the east of the palace. After king Min Bar had passed away, king Min Ra Zar Gyi, the grandson of king Min Bar, built the present pagoda enshrining the molar relic of Buddha in AD 1596. The pagoda is called Andawthein pagoda because the molar relic of Buddha was enshrined in it. The pagoda including the prayer hall measures 228 feet in length and 145 feet in breadth. The pagoda is 42 feet high from the plinth of the pagoda to the top of the pagoda. The pagoda was erected at the denter of the hillock and it is octagonal in shape and each of the facades of the pagoda is 27 feed wide. The big octagonal pagoda is surrounded by eight small pagodas on the roof of the cave tunnel. That pagoda is enclosed by fifteen small pagodas. The prayer hall is in front of the pagoda. It is enclosed with the stone walls. The east, the south and the north of the pagoda have the opening gates to enter the prayer hall. By entering the southern opening gate, one can see six standing stone Buddha images in the caves by the wall of Andawthein pagoda. By observing from the south to the north consecutively, one can find the first standing Buddha image in the form of Abaya mudra which implies, “Don’t worry, my dear. The people for those who practise and listen to the teaching of Buddha, will be free from the danger.” The second standing Buddha image is the form of Dhammasakkya mudra. The Buddha image whose left hand middle finger touches the middle finger of the right hand and it implies that Buddha is exponding the first discourse known as Dhammacakka and guiding the middle path. At the third standing Buddha image, the Buddha whose right hand palm is put on the left hand palm and enjoyed the blissful peace of Phalasamapatti, is called Zarnamudra. There are two cave tunnels inside Andawthein pagoda. One hundred and seventy five stone Buddha images with different sizes, are dwelling at the wall of the pagoda in the respective caves. To enter the inner tunnel from the outer tunnel, four directions have their own porches. Those porches were built individually in the arch roof system. The inner facades of the porches have decorations like a throne. There are eight Buddha images facting eight directions at the center of the inner cave tunnel. The upper portions of those Buddha images don’t have any robes. Some historians point out that the thin yellow robes were worn for the Buddha images to see the convex chest which is one of 32 lucky marks on the man. Every neck of the Buddha images contains three lines. It is believed that those three lines are a demonstration of wearing the yellow robes. Some historians assume that the yellow robes were not draped on the upper portions of the Buddha images in order to donate the cotton robes occasionally by weaving for good deeds. Among the Buddha images inside the cave tunnel, both of the two Buddha images at the entrances of the eastern and the northern porches, are unusual. The whole bodies of those Buddha images were draped with yellow robes and fastened the chests with the slings not to fly the edges of their robes when they go around in the sky with their supernatural power called Jhana. Arakanese call such Buddha images Zanthine. The Buddha images sculpted in Laymyo period, contain Zanthine because a lot of Arahats existed in the period. Eighty years ago, a muslim burgled the relinquary and he ran away throwing the things he took since a crowd of people followed him. When the people looked for those, they found the castet in the pineapple plantation. No sooner had the township officer taken away he casket to keep it than he opened it. After opening the casket, he got the molar relic of Buddha and the diamond Buddha image. The molar relic of Buddha was kept in the Chinese temple so that the people could worship it. By moving it from place to place to be worshipped, at last, the molar relic of Buddha was kept in Bandoola monastery in Mraukoo.